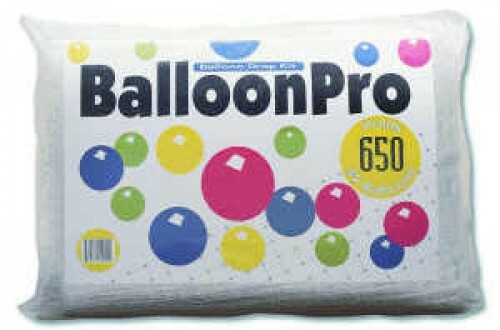 14 X 25 feet suits 650 9" balloons. 14 foot ceiling height recommended for full nett. For a smaller ceiling simply cut the net in half or to appropriate size. Contains one sheet 14 X 25 foot netting, ceiling clips, cable ties, and mono line. Fold and cut netting to the desired length. Weave the ripcord through through the netting in 8" intervals and about 4" from the open edge. Use several cable ties to seal one of the short ends of the net. Space the ties one every 6-8". At the time you wish for the balloons to drop , pull the ripcord gently but firmly in a hand over hand method. This method works best as it allows you to control the speed in which the balloons fall.